3Dimka teaches you a new way to see in 3D that costs nothing. Studies show most people would rather not wear glasses to view 3D movies and photos. This makes sense, the glasses are uncomfortable and not very stylish, plus they darken the images and limit the field of view. So technology companies are racing to develop the best 3D glasses free solution. To bad for them Mother Nature beat them to it. Humans have the ability to view 3D imagery with no glasses at all. Free-viewing is the term used for this special way to see 3D. Free-viewing comes in 2 flavors, cross-viewing and parallel-viewing. On this page we will discuss parallel-viewing and you can learn about cross-viewing here. 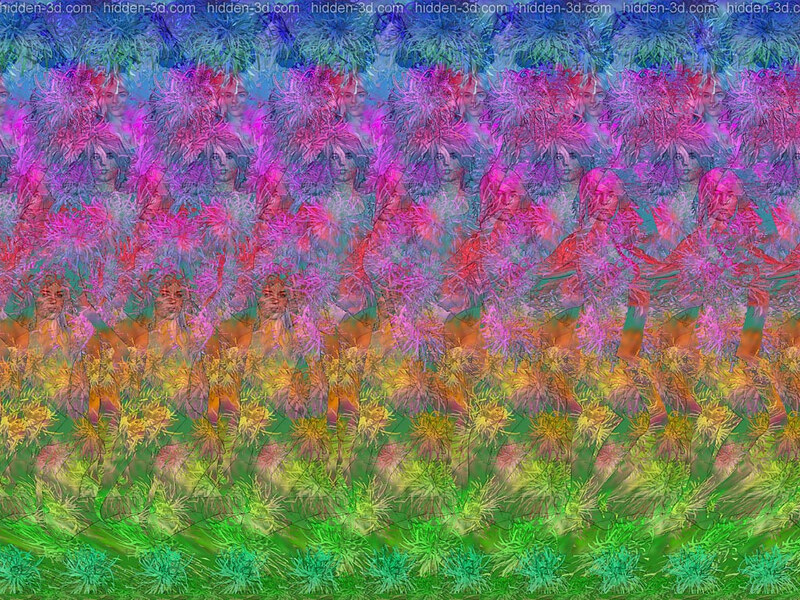 You may have seen “hidden-3D” or “magic eye” images which look like a repeating pattern as shown above. If you have been able to see the images hidden in the patterns then you have already free-viewed! 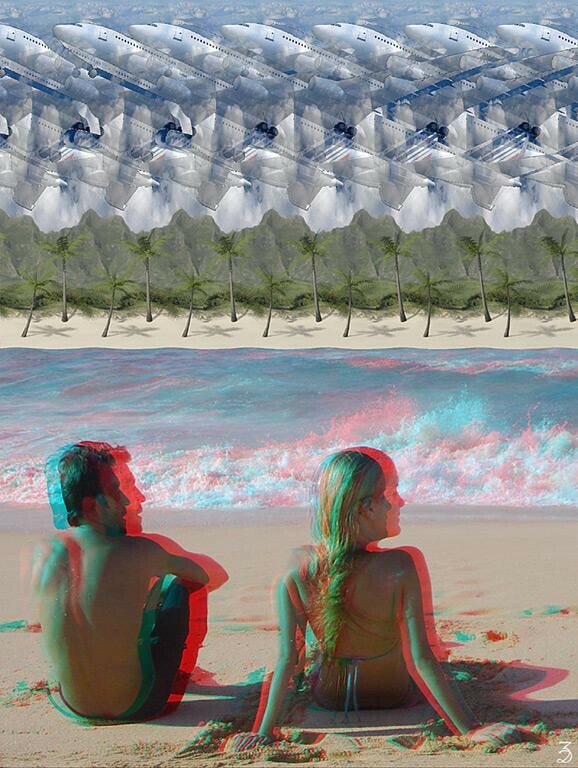 Parallel free-viewing requires you to let your eyes relax and look past the image so each eye only sees one view. It works for these pattern based images as well as for pairs of stereo photographs. You can learn more about how to view them in detail here. There are viewing aids that will make viewing parallel stereo pairs easier. Pokescope is popular among enthusiasts but a bit pricey and Loreo has paper based viewers that are inexpensive and work well. There are also classic wooden stereo-viewers which are still available. Almost everyone will remember Viewmasters which arrange the parallel stereo pairs on a disk for ease of use. Many of these viewing options are available online, one good source of 3D viewers is Berezin 3D. Not everyone can free-view. If you can not free-view then glasses will help you have a great 3D experience. There is an image at the bottom of this page that uses glasses to train you to parallel-view so you can try that as well. You can enjoy some of 3Dimka’s stereophotos in parallel-view format below. 3Dimka is active on Flickr and has even more imagery there. This last image can train you to free-view. It uses anaglyph glasses for the lower part and free-viewing for the upper. Put on your glasses and view the bottom of the scene, move your view up into the top and you should see the top in 3D as well. Then take off the glasses without changing your focus and you should see the top part in 3D with no glasses. Awesome images, especially the one with the three cheerleaders 🙂 Impressive work! 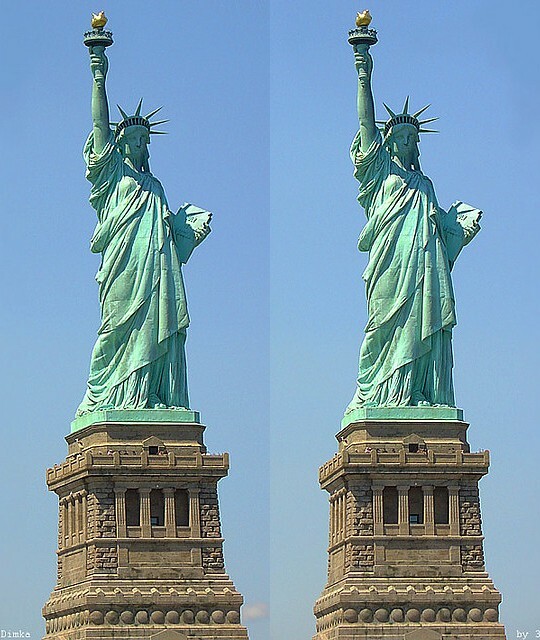 Great photos on this page but only the statue of liberty has images narrow enough to free view at my computer’s pitch (about 95 pixels/inch). Please provide images at 75% size. Wonderful photos but I too had problem with the landscape format images being too wide for my eyes to accommodate. There is a simple solution – most browsers can zoom in or out of the page. Hold the Control button down and press the – key to zoom out and the images shrink in size. I did and found I could then free-view the landscape photos. Control and + zooms back in again after you have finished. This tip works in Internet Explorer and Chrome and I’m pretty sure Firefox too. Finally I can see those 3d images. For years I thought it was the emperor’s new cloths syndrome. I find it really hard to parallel-view images that are more than a couple inches across. I can do the Statue of Liberty but not the other ones. I can do cross-eyed view easier on bigger pictures.